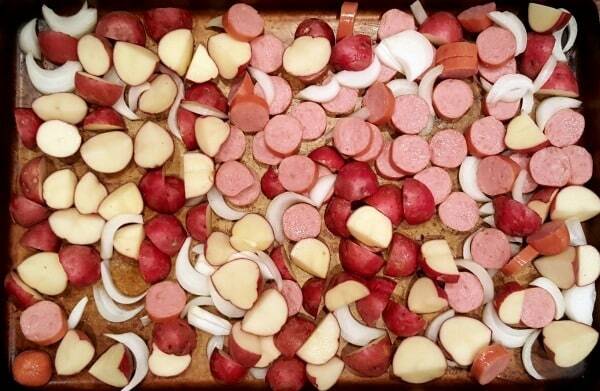 This sausage onion and potato sheet pan dinner is a quick and easy recipe for busy weeknights. It takes just a few minutes to prepare and only dirties one dish. While it’s baking, you can be helping the kids with homework or sorting the mail. You can season it however you want to suit your tastes so it’s extremely versatile. Served with a side salad or steamed green beans, it’s a well-balanced meal. You’ll love the simplicity of this dish! This recipe is so ridiculously easy, it’s going to be a stretch to break it down into steps. Step 1 – Lightly grease a sheet pan. 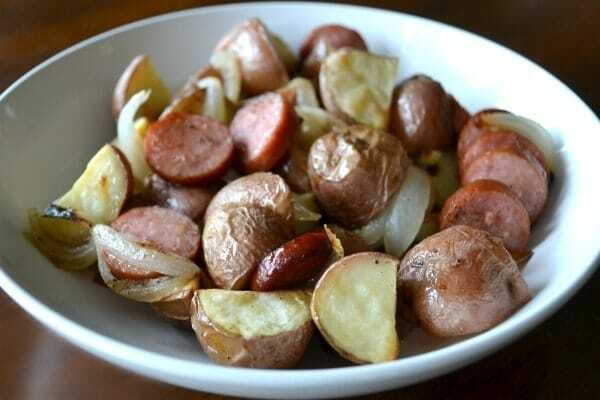 Step 2 – Slice onions, smoked turkey sausage, and red potatoes into bite-sized chunks. Spread them in an even layer on the prepared baking sheet. If your family likes Brussel sprouts, you can add them to the pan too. Broccoli, mushrooms and carrots are other popular choices. 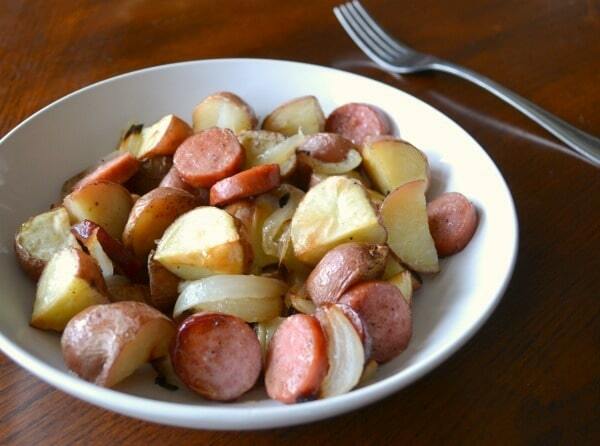 Step 3 – Sprinkle the sausage, onion and potatoes with salt, pepper, and garlic powder. If you prefer a Cajun flavor, use Creole seasoning instead. Step 4 – Bake at 425° for 25-30 minutes. Serve immediately. 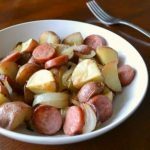 The kids love this dish because it’s basically a fancy version of hot dogs and french fries. I love it because it’s so easy to make and the clean up is a cinch! Here’s the printable version of the recipe. Lightly grease a sheet pan. Cut turkey sausage into 1/2-inch slices. Cut potatoes into bite-sized wedges. Slice onions into quarters and then quarter those sections. Spread sausage, potatoes and onions evenly on sheet pan. Bake at 425° for 25-30 minutes or until potatoes are golden brown. 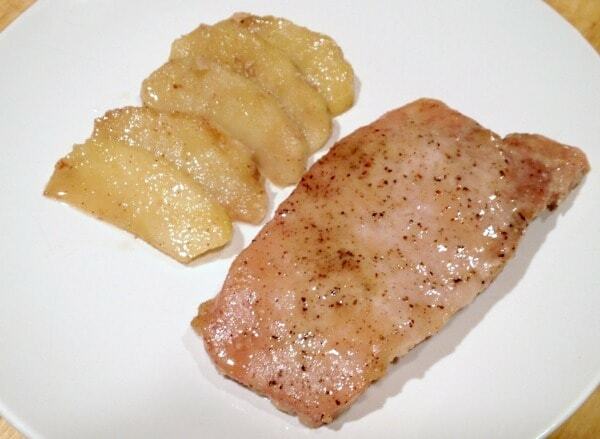 If you liked this recipe, you’ll LOVE my recipe for Baked Pork Chops and Apples with Brown Sugar Glaze. It’s the most popular recipe on my site and is a favorite in my family and many others. 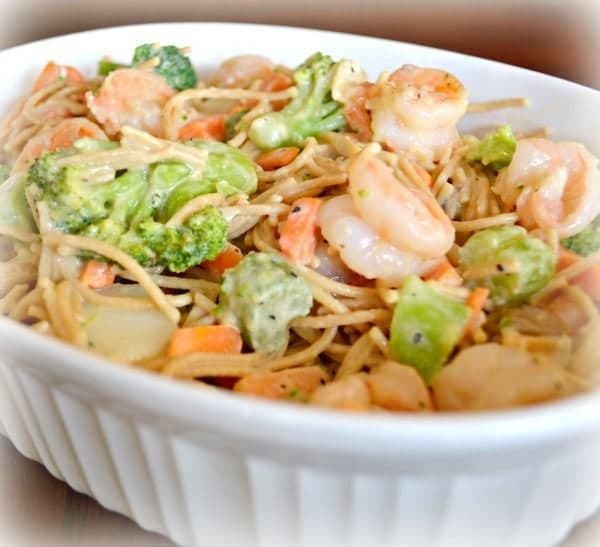 If your kids like shrimp, this Microwave Shrimp Primavera is another quick and easy meal to throw together. I have had this recipe printed for a while and finally made it. Holy Cow! I was not disappointed. My, my 3 boys, the girl friend of one, and my husband all loved it. It was crazy how this simple dish had so much flavor. I am not just gushing for fun, this was seriously delicious. We JUST had it and I am in the process of menu planning for the coming week and wondering if I can put it on the plan… is that too soon? This looks easy and delicious. I love sausage and potatoes together.